Julia has a crush on Antonio the ski instructor. Unfortunately, he does not know she is alive. Opportunity knocks when her aunt Sue asks Julia to help with her ski resort. Can you help Julia win the heart of Antonio and make the ski resort a success in this time management game? Ski Resort Mogul combines city-building with time management activities. In each level, Aunt Sue requires Julia to complete certain goals. These include earning a specific amount of money, constructing buildings for the resort or maintaining a certain level of daily income. To succeed, you will need money, resources and workers. Construct buildings by clicking on the appropriate icon located under the Guest tab at the bottom of the screen. Drag the building icon to an available empty lot. Note: If the building is gray when you try to purchase it then you are missing one or more of its requirements. Highlighting it with your mouse will let you know what that is. Once a cabin or hotel is built, you will need to attract guests. Buildings that are unoccupied are identified by a suitcase icon. Click on the Line tab to build a Pavilion or other building in this section for attracting new guests. Place this building nearby your existing cabins in an empty lot. Once guests occupy the cabin or hotel, it will continuously earn money. Sometimes you will need to buy buildings or land that is owned by someone else. This will display on your screen in gray. When they become available for sale, a green tag will appear next to it with the purchase price. Click on it to buy the property or land. In addition to building up the resort, you will need to be concerned about repairs. When a building needs repair, a wrench icon will appear on top of the building. This causes it to stop earning money. Repairing buildings also requires additional resources. Note: More resource materials can be purchased by clicking on the tab that has the brick icon. Another thing to watch out while playing Ski Resort Mogul is skiers that may potentially get hurt on the slopes. When this happens, click on the skier to save them. This will result in a reward of $1,500. Adding upgrades to existing buildings will earn more money. Like constructing buildings or repairs it requires money and resource materials. Some levels goals state that your cabins or other buildings need to be upgraded to a specific level. A building’s level can be identified by the number of yellow stars next to it. Shops also have a limited range. When the building is placed, look at the blue outline surrounding it. This indicates which cabins and hotels can benefit (and earn you money) at the shop. As levels are completed, the number of bonus points earned accumulates. These can be used to purchase additional items to help you improve your resort, like schools to train your workers etc. Your main source of income is the cabins and hotels that guests will stay at. However, constructing shops and restaurants will increase your money further. These items are located in the Shops tab. These buildings can also be upgraded to increase profits even more. 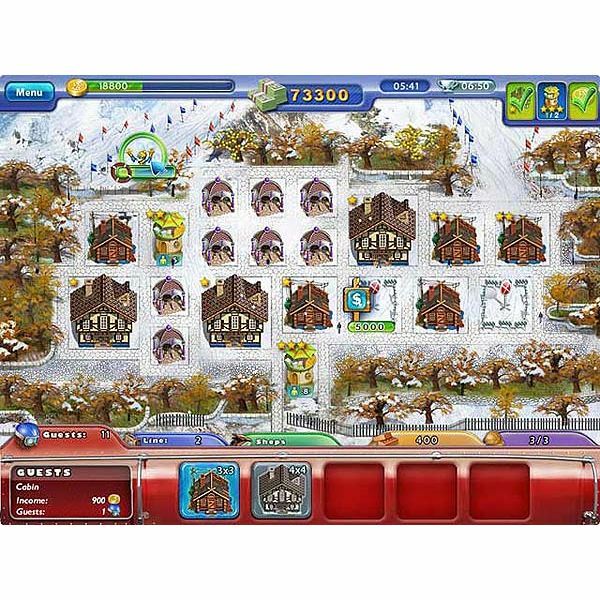 Screenshot images of the Ski Resort Mogul game were created by Sheila Robinson.